In Japan, there are family crests called "kamon" (家紋). They're similar to a coat of arms in the West. 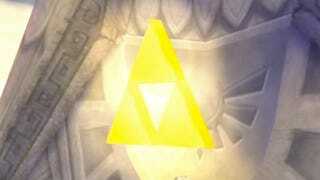 One Japanese Twitter user claims to have changed his family's crest to a familiar mark: The Legend of Zelda Triforce. Apparently, the iconic symbol even ended up on the family's gravestone. According to Twitter user @mahosyouzyo, "A relative passed away, and I was asked for an idea for a revamped family crest." The grandfather (I'm assuming the grandfather passed away) had always wanted to redo the clan's kamon for many years, the Twitter user explained. And @mahosyouzyo's design, it seems, was actually used by the family and even apparently carved into the relative's gravestone. "It's like Zelda," wrote another Twitter user. "Yep, what you said, lol", replied @mahosyouzyo, who agreed that it was a Triforce and claimed to be the most surprised about the end result—namely, where the design ended up. "I just kind of randomly drew it, not thinking much about it," added @mahosyouzyo. When asked whether or not the Hojo clan could complain about this similar looking crest, @mahosyouzyo replied that it seems to be okay if different crests resemble each other. (Note that people are prohibited from copying the Imperial Chrysanthemum Seal or the seal used by the country's Prime Minister.) With that kind of freedom, it's amazing there aren't more Zelda diehards in Japan with Triforce crests.